The following programs and/or stores support rescue in various ways - flat rate or percentage donations per purchase or a commission on the sales. We are a listed Not-for-Profit Partner with all of these programs and we would appreciate your support by choosing us as your rescue of choice when shopping on these sites. Some of the sites have a specific coupon code (or a specific link) to direct the donations to our cause, if they do not actually have a partner directory to choose from. If you follow the links (or click on the pictures), you should be connected automatically to where you need to be to sign up and start shopping. The Rescue Network offers a host of fundraising & educational opportunities designed specifically for rescues and shelters. One way they help rescues raise funds is by donating a percentage of any purchase at the Animal Wellness Market or any subscription to the Animal Wellness Magazine. Just click on the pictures to direct you to our referral link. For every purchase you make, not only are you ensuring your own pet's safety, but you are also helping feed, treat and rescue an animal. With your help, TagsForHope is able to raise the necessary funds every month to help bring hope and care to countless dogs & cats. BarkBox (US) is a box of goodies - treats & toys & happiness - that arrives in your mailbox as a monthly subscription. Bet your dog knows when it arrives! Bowzer Box (Cdn) is big on supporting the people in their own back yard. They donate 10% of their profits to animals in need. They support local animal shelters, rescues, outreach programs, and non-profit organizations that can use a hand making animals’ lives a little brighter. The boxes are for the dogs, but they support organizations that help all kinds of animals. The Bark'N Fun Company is a premium subscription box for Canadian Dogs! ResQwalk is a free mobile app that enables you to raise resources for animal welfare organizations, simply by walking. At the beginning of each month, ResQwalk puts together a ResQpool that includes cash and product contributions from corporate sponsors. In order to earn part of the pool, simply pick your favorite ResQpartner, start the app, and go for a walk, run or participate in any other outdoor activity that can be measured by GPS and involves a speed of less than 14 mph. At the end of every month, the ResQpool is proportionally distributed amongst the animal welfare organizations on the app. FundScrip is an established, Canada-wide fundraising program in which you pay for your shopping (groceries, gas, home & garden, entertainment, restaurants, and much more) with gift cards. Each purchase automatically includes a donation to our cause. Really, we're just asking supporters to change their method of payment for everyday purchases! If you don't already have the iGive button (the little dandelion seed next to your browser), please consider downloading this option. It makes donating even easier, so you never miss an opportunity. 5% on every sale if you mention us on your order form. 10% on every sale if you use our unique Partner Link or through the banner above or below. 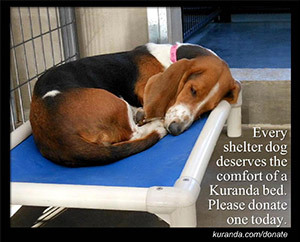 You can make a world of difference in a foster dog's life by donating a Kuranda bed to the rescue of your choosing. Special donation discount. Beds ship directly to the rescue.